Welcome to this villa overlooking the mountain, located in Moscari. It accommodates 6-8 people. This Finca Hotel offers peace and charm for those who want to forget everyday life for some days. Welcome to this cosy and rural Mallorcan "possessió" located in the area of the Tramuntana mountain range. It has an above ground pool and capacity for 6 people. Welcome to this charming town house with private pool overlooking the Tramuntana mountain range. Located on the outskirts of Moscari is perfect for 2 people looking for peace. Enjoy peace and warmth at this wonderful Finca Hotel. It is surrounded by the wonderful Mallorca fields of the village of Binibona, in the Tramuntana mountain range. Peace and comfort are waiting for you in this Finca Hotel. This is a lovely house surrounded by a beautiful countryside and the mountains of Moscari and Selva. If offers all the comfort to make your holiday an unforgettable experience. 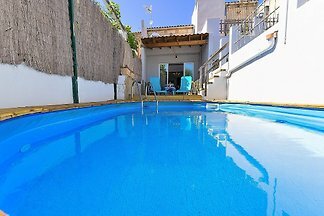 Nice villa with private pool in Selva, in the Tramuntana Mountains. It can comfortably accommodate 4 people. Rent successfully your holiday flat or holiday home in Moscari in only 20 minutes !